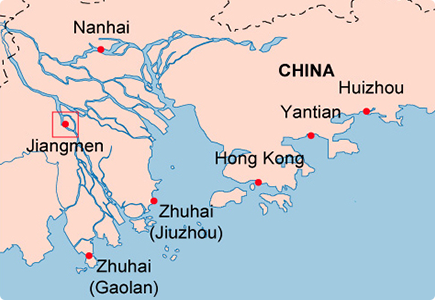 Jiangmen International Container Terminals ("Jiangmen Terminal") lies close to the Jiangmen High and New Technology Development Zone on the Xijiang River, approximately 53 nautical miles upstream from Macau and 99 nautical miles from Hong Kong. It offers handling services for both container and general cargo. 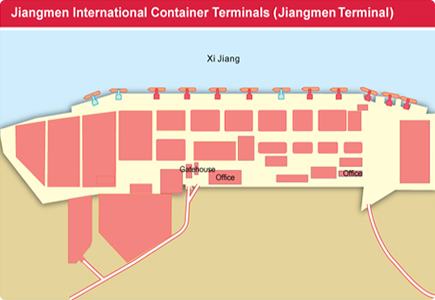 Jiangmen Terminal has warehouses with a total area of 9,200 square metres. Jiangmen Terminal is also capable of handling reefer cargo, using X-ray machines and CCTV systems to facilitate cargo inspection and on-site customs clearance at the terminal. Other services include local vessel and cargo agencies, on-dock container repair, cargo consolidation and off-dock warehousing. Additionally, Jiangmen Terminal provides regular feeder services to Hong Kong, Shenzhen and Nansha.